Axcet HR Solutions was among the first 10 percent of Professional Employer Organizations (PEOs) in the nation, and the only local Kansas City PEO, to receive the Internal Revenue Service (IRS) designation of Certified Professional Employer Organization (CPEO). To put this into perspective, there are currently between 780 - 980 PEOs operating in the United States. The voluntary certification process PEOs go through is exhaustive and not all PEOs who embark on the path to certification will qualify. We were proud to meet all requirements, including a documented history of federal, state and local tax compliance, financial responsibility, as well as organizational integrity. In addition to the initial application process, there are significant requirement to maintain this IRS certification. “While this IRS certification is voluntary, Axcet HR Solutions is committed to operating at the highest standard. 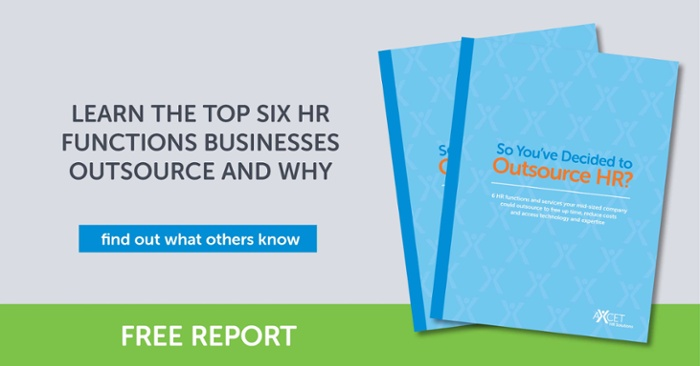 We take every measure to ensure our clients have the utmost peace of mind when they partner with us for all of their business’ HR needs,” said Jo McClure, Axcet HR Solutions Director of Payroll Administration. Axcet HR Solutions has been around for over 30 years, which dates back to the same time the PEO model came about. And since that time, the PEO world has grown significantly. In fact, according to the National Association of Professional Employer Organizations (NAPEO), PEOs provide services to between 156,000 and 180,000 small and mid-sized businesses, employing between 2.7 and 3.4 million people! 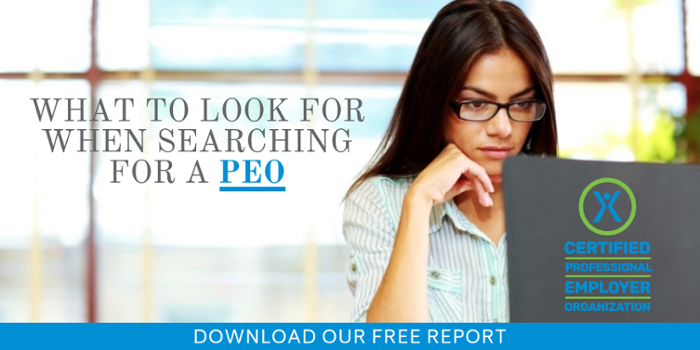 Yet when many business owners hear “PEO”, they still don’t understand exactly what they are and how much benefit they provide to small and medium-sized businesses. Professional Employer Organizations, or PEOs for short, provide full service HR solutions to small and medium-sized businesses through co-employment. This includes all aspects of payroll, employee benefits, human resources, recruiting, training, tax administration, compliance, safety and many more functions (see a full list of services). With 15,000 different tax codes that regularly change, and complex laws and regulations, it’s easy to see why a business owners would want to outsource this work to a professional, allowing them peace of mind and time to pursue their passion. Not to mention, providing small businesses with access to affordable “big business” benefits for their employees that include 401k plans; health, dental and life insurance policies, dependent care and more. Attractive, yet affordable benefits has been an area small businesses have struggled to be competitive with, especially when it comes to recruiting top talent. In a traditional arrangement with an uncertified PEO, the IRS held both the PEO and the client liable in regards to paying federal employment taxes. So, if a client had paid the taxes to the PEO, but the PEO didn’t pay their client’s employment taxes to the IRS, the IRS could go after the client even though the client had already paid the taxes to the PEO. But, under the Small Business Efficiency Act (SBEA), it is clear a CPEO is solely liable for the payment of federal employment taxes on wages it pays to worksite employees. When a client issues payment to the CPEO, the IRS can’t come back to the client to collect. The CPEO is held liable. Oftentimes, business owners worry about losing tax credits when choosing to enter into a PEO arrangement. The SBEA sets forth when businesses choose a CPEO they maintain the ability to retain certain tax credits. In a non-certified PEO relationship, switching to a different PEO mid-fiscal year came with tax penalties due to a change in the Federal Employer Identification Number (FEIN). This can result in double taxes being paid. According to the SBEA, businesses in a CPEO agreement will not be subject to a wage base reset. Therefore, they will not have to double pay certain taxes. Businesses who partner with a Certified PEO have added peace of mind knowing the PEO they selected has met rigorous background and experience stipulations, along with strict financial requirements. A certified PEO is simply the smarter, safer choice.